Are you as healthy as you’d like to be? The Bonfire Program is a free 90 Day health transformation program that will gently and effectively guide you through adopting healthier habits into your life within the domains of eating (fuel), moving (air) and thinking (spark). The Bonfire Program is a proven system designed to add wellness lifestyle strategies to your life – each week 3 Insights are delivered via email over 13 weeks (that’s 90 days). And, it’s free (and we don’t give your email to anyone). Change Your Health. Change Your Life. If your goal is to lose weight, it’s important that you do it in a healthy, scientifically proven manner that is sustainable and enjoyable. This program was developed from over 58 years of combined clinical practice. Let us come beside you and guide you, teach you, show you … how to adopt healthier habits in your life. The Bonfire Program has worked for thousands and thousands of people … just like you! Our motto is ‘We make it easier to get healthy’. It’s Free – Start today! Each week, three Bonfire Insights will be delivered to your email Inbox. 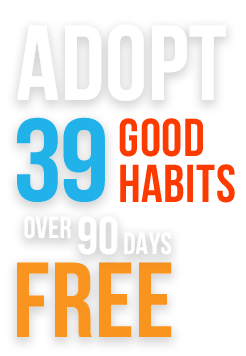 These Insights will help you add 39 healthy habits to your life! The Bonfire blog is also available so you can stay current on today’s health news. And last, we don’t let anyone else use your email information. The truth is that it can be hard to live healthy. It’s hard to make healthy choices. You are surrounded by unhealthy choices. The Bonfire Program delivers an easy-to-follow, systematic approach to adding good habits to your life. We do not focus on quitting bad habits – but rather, by adding good ones (we don’t ignore bad habits though). Start becoming healthier today – sign up and we’ll come beside you to help. It’s free and we don’t share your email. What are others saying about Bonfire?